Who am I? I have always considered this the most difficult question to answer or write about, especially today, three years from the start of the Syrian revolution. The truth is that I don't really know how much I resemble the young woman I was before. Writing for Global Voices could be an opportunity for me to reaquaint myself with myself, or at least remind myself of who this person whom I live with, and who is me, has become. Today I am 29 years old. My name is Marcell. The name means “young warrior”. I come from a small family. My late father, may God have mercy on his soul, was an Orthodox priest. And my late mother, may God have mercy on her soul too, was a housewife and a great mother. I studied dentistry in the city of Aleppo until I reached a point where I realised that I was more concerned with social issues. I left medicine and I studied political science – international relations and diplomacy, to be more precise. I cannot introduce myself without telling you about my city, Aleppo, as the two of us are exactly alike: worn down, exhausted, full of fire, full of the desire to live, confused. Aleppo is the second largest city in Syria. According to statistics, its population used to be 5 million. I am not sure how many of them still remain, and how many refugees from other places have come to live here. I discovered my ability to express myself orally and in writing from a young age. It could be a characteristic I inherited from my father. I enjoyed writing essays at school, a chore other students considered boring. I read everything that fell into my hands. I also used to write on anything I could write on: bills, tissue paper in restaurants and in the margins of books I was reading. And when blogging arrived, naturally, I took it up. And this is what happened. I started blogging in 2008. At the time, I had friends who were paying the price of freedom of speech in Syrian regime prisons. This was enough for freedom of speech to become my mission, which turned me into a regime opponent early on. An opponent of a regime that supressed general freedom and civil life. During one protest, volleys of bullets started raining on us from the Syrian security forces’ firearms, and those around me began running. I discovered then that I am one of those people who is paralysed by fear, which prevents me from moving and turns me into an obstacle for those trying to run away. My friends grabbed my hands and pulled me away to protect me, and since that time I have been collecting stories about being on the verge of death, injury or arrest, and how people more rational than I would intervene and rescue me. It took some time for the Syrian secret service to develop a dossier on me, especially considering that there is at least one informant for every 10 Syrians. During that period, and after a year of protests and listening to advice on being careful from family and friends, the turning point arrived: my mother was martyred at a Syrian regime forces’ checkpoint in Aleppo. I lost a part of me forever. 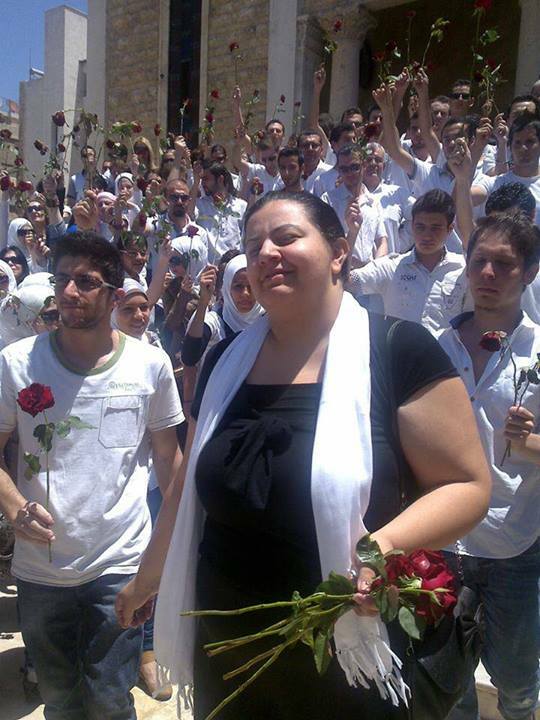 Because of the amazing funeral, attended by many revolutionaries who carried my pain with red roses, the authorities began calling me in and interrogating me about my activism on a weekly basis. At that time, the armed revolution was edging closer to Aleppo. At the time, I was against armament in all its forms. I believed peaceful change would guarantee Syrians their rights and result in the smallest number of sacrifices. In fact, large portions of my city have already been liberated, except for my neighbourhood and the places I am familiar with, which have remained under the Syrian regime's control. When the interrogations became more serious, and it looked inevitable that I would soon be arrested, I decided to accept a scholarship to study for a Masters degree in human rights in the UK. Like any survivor of bloody events such as I have witnessed, during that year I returned to Syria over and over again, to Aleppo, driven by guilt. I moved from one friend's house to the other, as it was dangerous for me to return to my own home, until my friends’ lives, too, became endangered as a result of their association with an activist like me. I was then forced to make what was obviously the right decision, and moved to the liberated part of Aleppo, leaving behind friends, family, memories, my home and the two graves of my parents. In short, most of the life I was used to. Living alone as an activist during wartime, alone and away from family and familiar surroundings, posed new challenges. I had moved to an area which I knew nothing about, except that the regime's security apparatus had no presence there. But it wasn't free of all the other forms of death. As one of the very few unveiled women in conservative and humble surroundings, among people who are very kind, despite the violence of their environment, I sometimes suffer from petrifying loneliness. I live with the constant fear of being kidnapped. At times I can withstand it, but at others I break down in exhaustion. I am surrounded by stories of heroes whose heroism might inspire others to effect change themselves. Because of all this, and because our daily lives are full of events which may not be enough for one lifetime, I have decided to write for you. My articles will some times be about my everyday life. At other times they'll touch upon memories and what we would love our lives to be like, despite the horrors we see. You are free to choose to sympathise with me, or be harsh with your judgements. But my hope is that what I relate to you reflects some of the dream, the desire to change, and the trust that this change is possible, as far-fetched or painful as that dream might be. This post is part of The Bridge, featuring original writing, opinion, commentary and investigation from the unique perspective of the Global Voices community.